This place is easy to spot and smell in such a secluded area. Plumped off Komachi shopping street, Beer Komachi is the only shop open late into the night as the small restaurants and izakayas dotted around it close down for the night. Like Bungalow, Beer Komachi also spouts the plastic covering out front although being situated down a small shopping street, it’s hard to see why when it’s protected from the elements. The smell from the owner cooking wafts out of the shopping street with passers-by wondering where it came from. Like Beer Cafe Bakujun, Beer Komachi seems to have taken the minimalist concrete effect to heart. 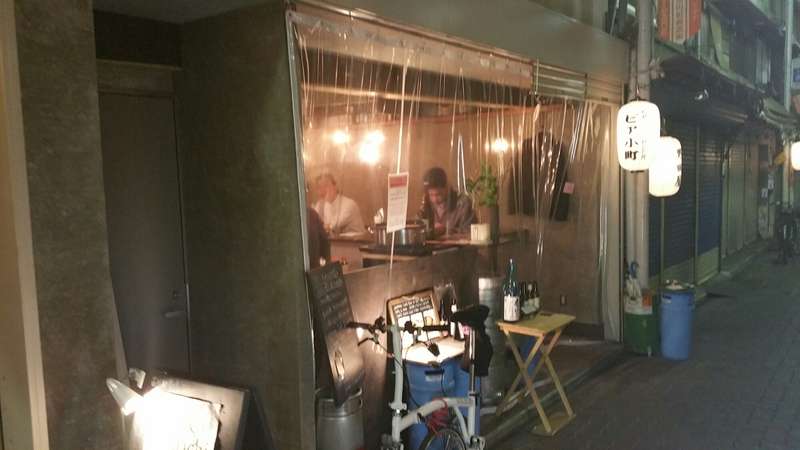 There are seven seats at the bar which seemed to be taken by the regulars and there are some high chairs and tables behind the bar with some low tables and chairs located at the back of Beer Komachi. There is no table charge so you can sit wherever you want and not worry about it. Most importantly though is that there is FREE WIFI! We’ve had a few requests to note this from viewers and the owners have kindly written the SSID and password above the bar in English. Six taps at most times though sometimes eight. With some bottles thrown in for good measure. There are anywhere from six to eight beers on tap at anyone time and rotate around as the days go on. All but one of the taps was Japanese on the day we went, and Beer Komachi helpfully lists forthcoming beers on the menu as well though there is not guarantee which one is coming on. While we were there, one keg finished off, the Minoh Osaru IPA, which was replaced by another IPA, the Oh! La! Oh! Raiden IPA once the pipes had been cleaned. Beers come in two sizes and include tax, UK half pint size (284ml) for ¥650 and US pint size (473ml) for ¥1030. There are also bottles on the menu too. Daisen G Beer Yago – a rice ale that was mouldy, in a good way, and reminded me of sake. Akashi Kuro Beer Yukyu no Toki – a schwarz beer with a strong wood flavour. Oh! La! Ho Raiden IPA – the table was leaning. It wasn’t my fault. We started off with the Daisen G Beer Yago as we had seen the bottle earlier at Yamaoka. It was surprisingly reminiscent of sake due to the mould flavour we picked up but nice with a citrus finish. Following up this beer was hard due to the unique taste thought the Akashi Kuro Beer Yukyu no Toki more than enough held up its end with pleasent schwarzbier flavours with a dash of chocolate. We wanted to finish off with some bite but the Minoh Osaru IPA blew just moments before we had finished. Next up was the Oh! La! Ho Raiden IPA, another one from the seasonal range and was not let down. Good hoppiness with a bitter finish. Stunning presentation with these pickles and a cracking bite to them. We weren’t very hungry when we came in to Beer Komachi as we had met some friends just beforehand for some yakiniku but after seeing some of the food on the menu and how it was delivered, we had to try SOMETHING. 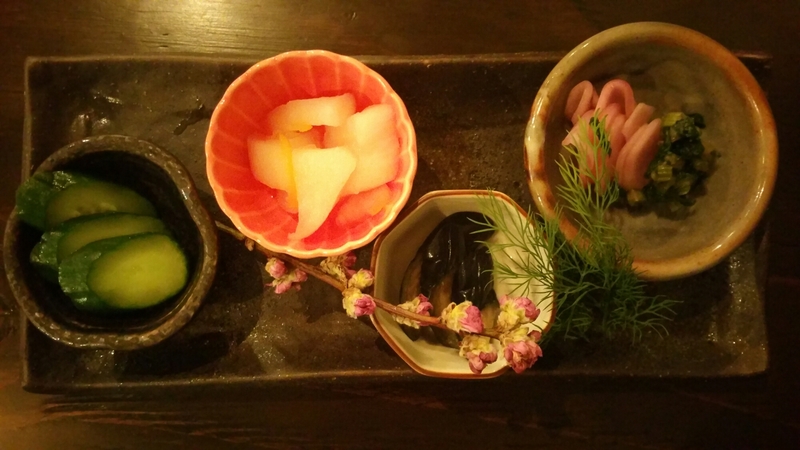 The pickles came highly recommended from the owner and she even explained in English why they were so good. After what seemed like an eternity, heck, it’s pickles, they turned up and the presentation was spectacular. Words will never do it justice. Beer Komachi was an unknown quantity for us before we walked in there but the friendly owners were knowledgeable about the beers they had and were willing to explain, in English no less, about how good they are. The cosy warm atmosphere kept us there longer than what we originally intended to stay for but after two beers, we didn’t want to leave. Beer Komachi is located about two minutes from Higashiyama station on the Tozai line. Make sure you take exit number two as that is the closest to the bar.